While hydroponic technology is taking off, there’s still concern over the efficiencies of growing indoors in a controlled environment. One of the primary concerns is economic viability when it comes to the resources being used in production: water and energy. Though there’s still plenty of room to grow in terms of the technological advancements involved in indoor growing, there are plenty of methods available presently to greatly reduce both energy and water consumption. We’ve explored some of the innovative water saving methods in hydroponic growing which included capturing water vapor, wastewater recycling, and rainwater harvesting. Now it’s time to look at some hydroponic energy saving methods. When growing indoors, you’ve already eliminated one of the essential elements of growing plants: light. Therefore, artificial lighting must be used to supplement the sun. This can be seen in fact as a positive aspect of growing in a controlled environment as many new artificial lighting technologies actually help produce better quality yields than in traditional outdoor and soil-based agriculture. In the past, many growers have used HID (High Intensity Discharge) lamps because they have been most widely available at the consumer level. 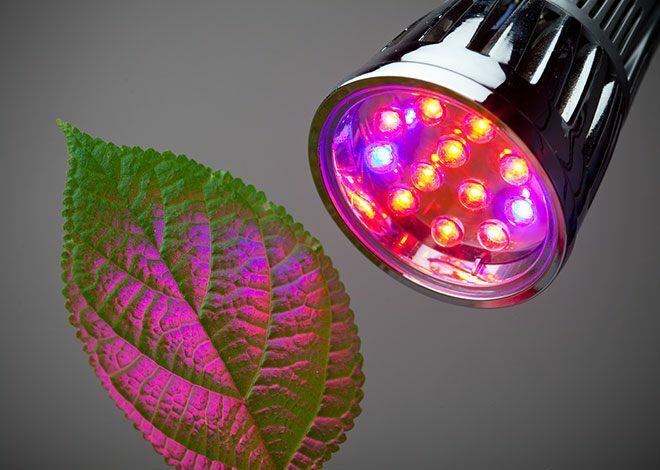 But recent advancements in LED horticultural lighting technology are creating a new base of consumer demand for this highly efficient lighting option. LED’s have been known to save anywhere between 50 and 90 percent more energy than some other forms of horticultural lighting. Not only are they more energy efficient during operation, they also have a longer life-cycle meaning they’re potentially a better investment despite the higher price tag. In Controlled Environment Agriculture of all scales, you want to ensure you’re maximizing your space and resources as much as possible. This includes not letting anything go to waste. Whenever energy is being produced there’s a certain expected percentage of heat loss that occurs due to basic energy transfer. However, we can prevent heat loss through proper insulation practices. The use of grow rooms and chambers, or smaller growing areas mean less chance of energy being wasted on non-productive spaces. These smaller spaces that are properly insulated are more effective at trapping the energy inside which ultimately maximizes light output. Optimizing your indoor garden’s energy saving methods is important year-round because there will of course be times throughout the year when you will require more light and heat to maintain proper conditions.